Conor McGregor's coach insists the melee following the Khabib Nurmagomedov fight on Saturday night "wasn't a big deal" and has called on fight authorities to go easy on the UFC lightweight champion. McGregor suffered only the second defeat of his UFC career after the Russian locked him in a rear-naked choke in the fourth round. But the scenes immediately after turned ugly when Khabib escaped the octagon to attack McGregor's training partner Dillon Danis, and while a riot broke out outside the Octagon, three of Khabib's team jumped into it to attack McGregor – who was still recovering from being choked out. Nurmagomedov, now an unblemished 27-0 following the win in Las Vegas, could be stripped of the belt and is yet to receive any of his fight purse from the Nevada State Athletic Commission. Khabib claimed his actions were a result of the provocation from McGregor, who taunted the Russia for his religion, his background and insulted his father. 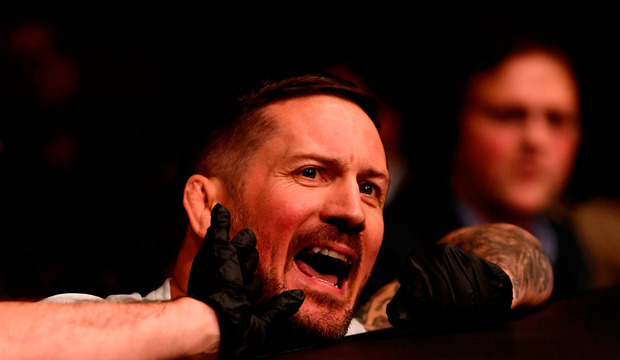 And John Kavanagh for his part understands why Khabib did what he did. "I hope (the NSAC) is lenient on him," he said on The Joe Rogan Experience. "Not just so we can get a rematch. I just love watching him fight. I can stretch myself to understand his reaction. I can't stretch myself to understand (his teammates') reaction. For Khabib, it's not the end of the world." Kavanagh had a front row seat as Khabib leapt over the cage and attacked Bellator welterweight Danis. "(Danis) actually didn't say anything," Kavanagh added. "I was standing beside Dillon. I didn't see what he did, but I could hear. He didn't say anything. When I watched it back, I could see him beckon (Nurmagomedov) on. "It's just stupid end-of-fight stuff. But it didn't justify that level of response. Maybe there was something else in the build-up. "Dillon is a little bit of trouble online. But, like I said, it wasn't that big of a deal to me what Khabib did. It just really wasn't." McGregor did not appear after being allowed to leave the T-Mobile Arena, but later elected not to press charges against the three individuals who attacked him, who were all arrested by Las Vegas Police but later released. Instead, McGregor posted a message on Twitter that simply read: "Good knock. Looking forward to the rematch." He has gone to claim he "won the battle". Nurmagomedov said that he wants to make MMA a "more respectful sport", complaining bitterly about McGregor's behaviour in the weeks ahead of the fight. "I told you guys: his whole team and him, they are tap machines. Today he tapped. Undisputed and undefeated," he said. "This is a respectful sport. This is not a trash-talking sport. I want to change this game. You cannot talk about religions and nations. This for me is very important. Thank you for waiting for me. I know my father is gonna smash me when I go home. Nevada: sorry. Vegas: sorry." UFC president Dana White attempted to pick the bones out of the disgraceful scenes which overshadowed what had been billed as the UFC's biggest night ever. "A lot of bad stuff," White said. "A lot of bad stuff that shouldn't have happened. All hell broke loose. I don't even know what to say right now. I'm just disgusted and sick over it." Khabib's manager, Ali Abdelaziz, has since come out in support of his man despite the post-fight drama labelling The Notorious an "amateur". Abdelaziz said: "I want to congratulate my brother @khabib_nurmagomedov the undisputed, undefeated pound-for-pound King. There was never 2 Kings from beginning, only one King." Then, taking aim at McGregor, he said: "This is not the way we want to celebrate such a dominant performance but when you talk about people's country, family and religion and intentionally try to kill someone like he said and the cornermen running their mouths after, this is the fight game & s**t happens. "The fans got an amazing fight and a great show. I want to apologize to the Nevada athletic commission, the Governor of Nevada and I want to thank Las Vegas police department and security for doing such an unbelievable job. "Now everyone understands who's the amateur here."